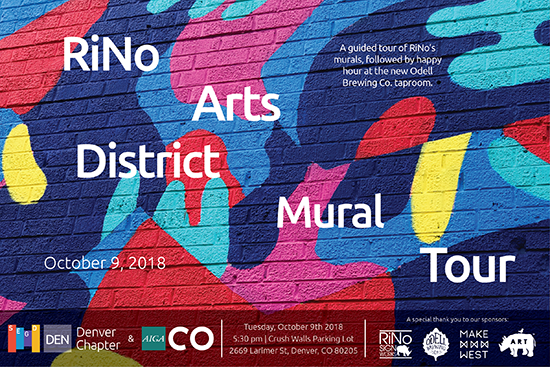 SEGD Denver is teaming up with AIGA Colorado and the RiNo Arts District to offer a guided tour of the area's iconic murals. Join us for a conversation about public art, placemaking and one of Denver's hottest neighborhoods. Odell Brewing Co. will be hosting a networking happy hour for all event attendees at their new taproom following the tour, with the first round of drinks on them. This guided tour of the RiNo Arts District's murals (including new work by Shephard Fairey and Crush Walls 2018's latest additions) will be led by RiNo Arts District staff and will offer attendees a chance to learn more about the neighborhood recently named one of America's Top 10 Hippest Neighborhoods, according to Time. Cost: $10 for members of SEGD or AIGA, $15 for non-members.